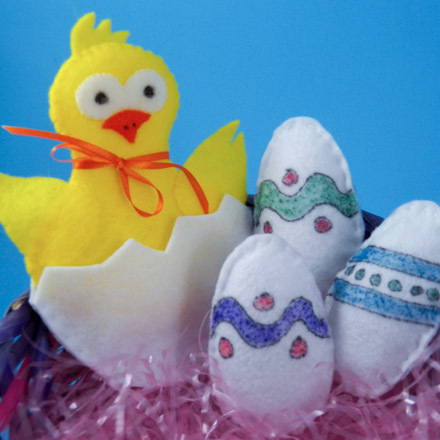 Have some sewing (and weaving) fun with these projects that use needle and thread. All are simple enough for new sewers while allowing for creativity for those with good sewing skills. Washcloth Bath Bags Friday Fun - Sew up a nifty bag for your bath from a washcloth and ribbon. Put soap or bath salts inside and relax in a sudsy tub of warm water. But don't stop there! The bath bags also double as bath mitts for the kids. They also make great gift bags for handmade soaps! Weave a Pincushion - It's easy to make a pincushion in any color you like with a little yarn woven into fabric on a cardboard loom. It's just a matter of forming a tube with the woven fabric, stuffing it and sewing it close. Yarn Octopus Friday Fun - See how easy it is to make a little yarn octopus that is the perfect size, about 5", to hang on your backpack. These little cuties are just right for your yarn leftovers. It also makes a terrific gift or craft bazaar sale item. Stuffed Felt Names - Kids love to see their names spelled out! In this craft project see how to cut out, sew and stuff individual felt letters and then join them together to create a bright and cheerful personalized wall hanging that's perfect for the bedroom door, on the wall or over the crib. 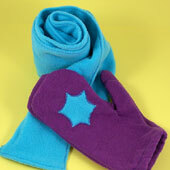 Fabric Mitt Hand Puppets - In this project, sew up versatile mitt-shaped fabric hand puppets. Printable patterns are included for cat and rabbit puppets. Starting with the basic mitt-shape, use fabric markers, embroidery and a few felt cutouts to make puppets of your own design. Stuffed Felt Animals - The project features stuffed felt animals—a chick and a bunny. Beginning sewers will use the overcast stitch to assemble the animals, while more experienced sewers can improvise with stitches and embellishments of their own choosing. Sewing Cards - For generations, children have been playing with sewing cards. In this project, see how easy it is to make your own sewing cards out of cardstock, then sew on them with colorful yarn. Adults can take the sewing cards a step further to make scrapbook and greeting card embellishments. Woolly Octopus Friday Fun - In this craft project, learn the British way of making a yarn octopus. This technique is a disarmingly simple way to make a cute toy with items found in most people's homes, and it will use up those leftover scraps of wool (yarn). Mittens from Sweatpants - In this project, use old sweatpants to make mittens for kids. This is a great way to recycle the fabric from all those holey and stained sweatpants (and sweatshirts) that no one can wear anymore. This is a good project for new sewers. The Game of Achi - Make a felt or paper game board for Achi, a game from Ghana in West Africa. Children play similar games all around the world. Some of the oldest games are in a group called games of alignment. Tic-tac-toe is one of the most popular of these games in the United States, but in Ghana the children play one called Achi. The Mittens from Sweatpants project includes instructions for making a scarf to go along with the mittens.